news and opinions for new home design center staff and builders: shelter and interiors, marketing and merchandising, consumer shopping behavior and retail trends. 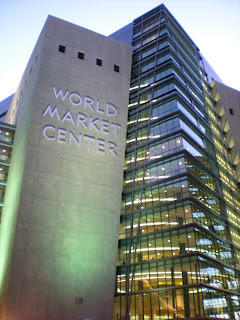 World Market Center is now the largest furniture and interiors market in the world. Attendance at last week’s Vegas interiors market was down, but I have never seen educational and developmental seminars more full. In fact, I was almost ‘locked out’ of the very important Pantone color forecast presentation! Thanks very much to my new found champion, Jason Phillips of the very hip décor line “The Phillips Collection” (available to the trade only) for helping me get in the back door and be able to report back to you on interior color forecast for 2009 and 2010. (Yes, there is a story there but perhaps one better shared in person than in print. ) (Thanks again Jason…I owe you!!) With the stiff competition trying to get in the door, you would have thought I was trying to access a sold out rock reunion tour rather than an interiors trend seminar, but never mind, I got you the goods. I felt the freshest news of market is the continued innovation; focus on design (and also price point) in furnishings and décor. How refreshing (even at the upper end) to hear manufacturers and product design incorporate ‘providing value’ to the end consumer. 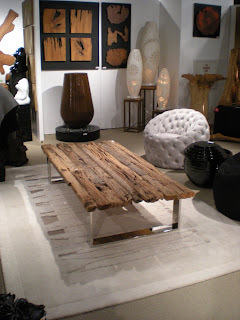 I’ll have a future post dedicated to furniture, lifestyle and décor trends, with photos and links. You won’t want to miss the recap on Michelle Lamb of The Trend Curve's presentation on top stories for 2009-10. Never far from any discussion was the recession or ‘downturn’ (depending upon who was speaking) and how it would impact the consumer’s decision making process and ultimate preference for goods. 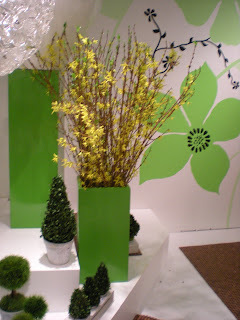 I was very fortunate to attend Leatrice Eiseman’s Pantone 2010 Home and Interiors Forecast presentation. (She said we were the first audience for the new forecast) Leatrice Eiseman heads the Eiseman Center for Color Information and Training and is also executive director of the Pantone Color Institute. She conducts color seminars and develops directional forecasts. She is widely quoted in publications such as Elle Decor, Home Magazine, House and Garden, Home Accents Today, Glamour, Vogue, People Magazine, The Wall Street Journal and The New York Times. 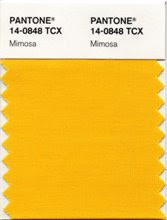 You probably read the release this fall of Pantone’s “Color of The Year”, PANTONE 14-0848 Mimosa. You also may have seen a strikingly similar shade on Michelle Obama at the inauguration. Pantone’s quote: “Mimosa Embodies Hopefulness and Reassurance in a Climate of Change”. 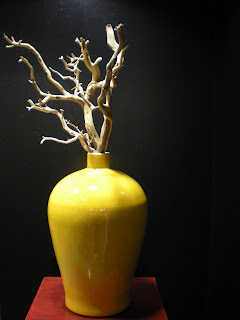 You will notice many golds and yellows throughout the new color forecast. Click here for a copy of the forecast to print or email. Historically in times of recession or downturn, trends can slow. However, technology (blogs, Twitter (My Twitter profile here) and other social media) has now begun to spread design ideas and trends at the speed of light. 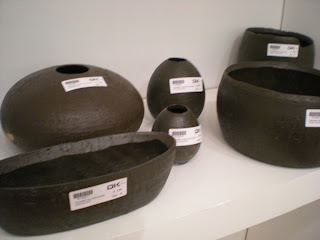 Eiseman referred to the continued influence of fashion on the home décor and design industry. Those of us in the industry have to be even more focused on differentiation and design, rather than less…The new directional color forecast takes the economic and social environment into account, and keys on historic behaviors. In an economic downturn, consumers are more cautious with their purchases, and may take fewer risks with larger dollar purchases. They still, however, desire ‘design’, freshness and impact, and will be savvy and smart about making their purchase decisions. Leatrice Eiseman spoke to 8 color palettes that will resonate to the consumer, even in the current downturn. Historically in a sluggish economy, the consumer will be more reserved, cautious and thrifty, but will still seek inspiration with color and design. Predictably, bigger ticket items will be neutral and safe, yet ‘smart’ and well designed. The consumer historically will seek out color and impact with accessories in brighter colors, trendier design, and lower price points. Regarding styles, Eiseman advised that traditional never really went away, but the new look would be modernized, and offer contemporary touches. Eclectic combinations were directional rather than the matchy-matchy of the 80’s. 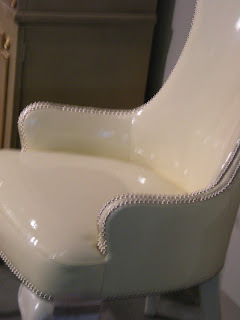 This chair from Robert Allen is a great example of a traditional silhouette and detail (upholstery brads) in a clean, fresh and unexpected patent leather. The recently empowered and educated HGTV audience will seek out color as an accessory and statement. Remember that ‘green’ (i.e. inspired from earth and Mother Nature) will be newly considered as a neutral. And as Leatrice so eloquently put it, even in times of down turn, purchasers will still fantasize about ‘feathering their nest’. In the downturn, Eiseman quipped, feathers may look more like a feather duster and less like a feather boa. Indicators point to the consumer being more mindful of resources and the environment, and sustainable materials: appropriate woods, bamboo, and recycled felt, for example. When money is tight, we can predict the consumer “burrowing”(today’s version of hiving or cocooning), turning to at home diversions such as entertaining, cooking, eating healthier, and focusing on the ‘hub’ of the home (family room/kitchen)~Do I really need to mention the importance of a fireplace here??!! Use of recycled or eco-conscious materials will be the newest status symbol. ( Can a handbag made of auto seat belts really retail for $98 -$178? ) 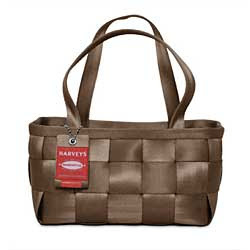 Yes, and Dana Harvey’s Original Seatbeltbagsbags are very often sold out or have a waiting list at boutique retailers. Michelle Lamb titled her fresh neutral’s “Chameleon Neutrals” and both titles are apropos. 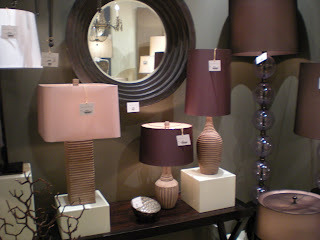 Neutrals at market had grey/brown and even blue and violet tinges. Some changed shades depending on viewing angle or lighting. These weren’t your typical 80’s oatmeal’s and beige's. Because we in the interiors market are closely tied to fashion, it is interesting to watch what is going on in that market. Women’s Wear Daily listed hottest 10 colors, number one was “Iron”, a practical yet rich color of black/brown/charcoal grey. OPI cosmetics are always one of my favorite color barometers. A ‘best seller’ for fall/holiday was "You Don't Know Jacques", a beautiful charcoal grey/brown neutral. (Yes, I have it and love it, and wear it often - thanks for asking…) OPI will be reissuing it due to buyer demand. OPI's "You Don't Know Jacque"
Think urban farmers market with a focus on upscale, sustainability, cuisine and style – The Alice Waters influence, perhaps?? Speaks to natural resources, and the importance of their management, conservation and preservation. Most original in the way the colors are put together- they will command the attention of the consumer. Imagine all the colors of the Arizona and New Mexico mountain landscape at sunset. Historic influences, but not the 80’s burgundy and hunter. Original in the quirkiness and sense of fun, yet strongly influenced from traditional style. Think traditional hounds tooth check, yet blown up to a huge scale, and interpreted in fresh colors. 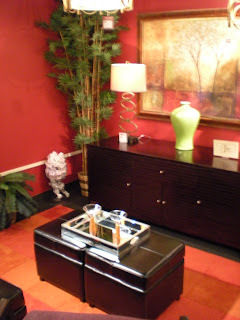 Takes into account the client who loves color but may be impacted by the economy. Colors are muted, like the steel blue grey, light grey, and pinks, pointing toward historic ‘glamour’…. 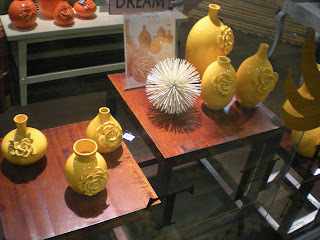 A fresh take on African and tribal influenced design, Yellows in mustards and dijon’s become very important. Leatrice described the grouping as exotic yet sophisticated. Galaxy is a grouping that speaks to the colors in the night sky, and dusky colors of earth. Yet another gold resonates as the center of out universe, the sun. High Definition Is a glamorous and refined palette that draws on both a classic and modern feel. Think Marlene Dietrich’s boudoir, with a base of silver, grey and peat, and romantic touches of the rose, purples and golds. Influenced by Japanese anime and menga (illustrated comic series with cult followings) and Japan, pastiche pairs unexpected color combinations and clever contrasts. The colors remind me of a colorful ice sherbet case on a Paris street – hard to choose just 2 or 3, but the whimsy of the colors will bring light and life to the viewer. Great for accent colors or children’s rooms. Eiseman advised those of us in the trade to “LOSE YOUR COLOR JUDGEMENTS”, as we start to see color combinations that are at minimum, non-traditional, and most, challenging. 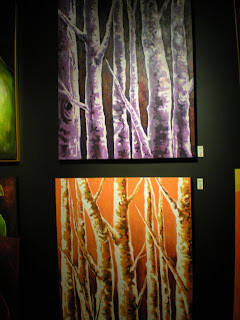 Directionally in 2010, she sees dark colors being combined with “pops” of color. Even in a retail setting such as your design center or on a website, she advised to show pops of bright color as a must-do to catch the eye of the consumer. Consumers will begin using paint even more as a statement accessory, and as the most value oriented design update. For your home options sales, consider adding color (not just quality) upgrade options in your paint option offerings. Absolutely show color pop walls in your models and design centers. Color is the first element of design that is noticed by the viewer. It is also the least expensive update in merchandising a retail space as well as a home. 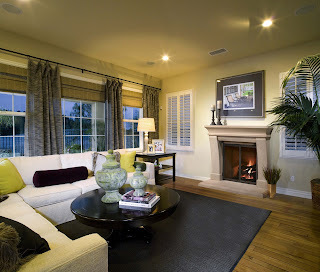 In your design centers and model homes, where could you update a wall or room with color to create more visual impact, bring your presentation more 'current' and 'fresh', and connect to your home buyer? accurate color. PANTONE® and other Pantone, Inc. trademarks are the property of Pantone, Inc. © Pantone, Inc., 2008. All rights reserved. Krisann Parker-Brown is the merchandising manager for Hearth and Home Technologies, the leading manufacturer and retailer of fireplaces and hearth systems. Krisann supports design centers and new construction builders in presenting Heat & Glo, Heatilator and Quadra-Fire hearth systems, and consulting on design center merchandising, point of sale and the consumer experience. 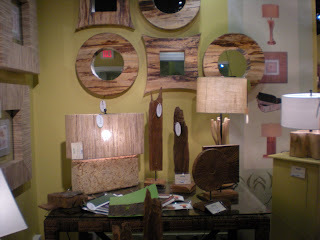 Krisann is a member of the Retail Design Institute. Contact her at brownkr@hearthnhome.com or 952-985-6537.